her hair was long, her foot was light, and her eyes were wild. When I was between 6-9 years old my father was stationed in France with the Air Force. We traveled over much of western Europe and visited many castles. It was during this time I first became interested in knights, chivalry, and Arthurian legends. As a young boy I, and many of my friends, were captivated by the stories of knights fighting dragons, saving maidens, and performing other great quests. We used to dream of going off on a great quest of our own. While there may not be any real dragons to fight, there are other enemies that are just as great. Social injustice, bigotry and other of today's problems are harder to defeat than any dragon from legend. Sometimes just making it day to day seems like a battle. Arthur and Camelot are symbols of what we can be. Arthur is not perfect, however he has a vision of "might for right" and justice for all. Camelot is not the perfect society. There is intrigue, betrayal, adultery and a host of other problems. But through it all Arthur tries to do what is right. An historical Arthur would have lived shortly after the Roman legions have left Britain. He spends his life trying to keep the Saxon invaders from overcoming and conquering his land. The Saxons are seen as bringing the end of civilization. In truth, the ending of the Roman Empire did end civilization in Europe. While far from perfect, the Roman Empire had many benefits. The Roman Empire enforced the law. Her legions built and maintained the roads. Romans kept records of everything and many Romans were literate. Roman traders made goods available throughout the empire. Roman aqueducts brought water where needed. Roman villas even had central heating and indoor plumbing. The invaders destroyed almost everything. They did not care for books and burned them. For centuries after the fall few could read and write, or cared to. Trading became much more localized. The law was whoever was the strongest. It is in this context one sees the great symbolism of Arthur. He is the King who strives to protect his people from evil. He fights the good fight against all that would destroy what is good. Arthur is not dead, he is sleeping in Avalon awaiting the time when Britain (or we) will need him and what he stands for the most. No one knows for sure if Arthur is based on a true person. In his book, The Discovery of King Arthur, Geoffrey Ashe makes a case for Riothamus, a warlord in the early 5th century. Whether Arthur was real doesn't matter. The strength and longevity of the legend shows that mankind longs for heroes to lead us. 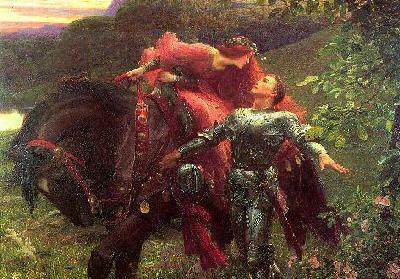 Chivalry is an integral part of the Arthurian legends. We could do far worse than following the Knightly virtues of Courtesy, Honor, Prudence, Temperance, Faith, Justice, Charity, Hope, Generosity and Strength. For a possible historical look at the Arthurian Legends see my review of the Camulod Chronicles on my Book page. ALMANACH de la COUR A compendium of articles on a variety of subjects, mostly connected with Orders of Chivalry, European and Non-European Royal Houses, and the European Nobility.